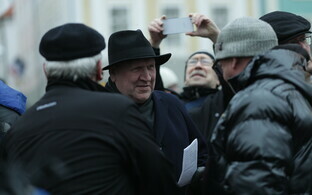 In ERR's March party ratings, the Reform Party overtook the governing Center Party. 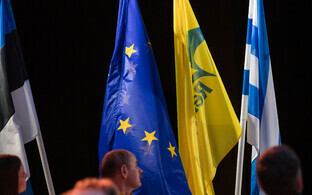 Despite their continuing infighting, the party is back as the country's most popular. 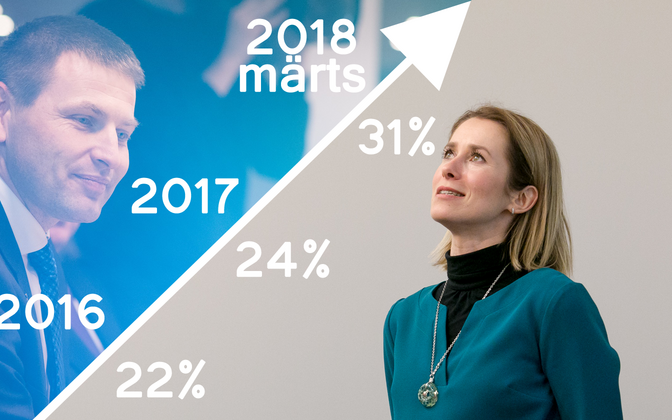 The survey, commissioned by ERR and carried out by Turu-uuringute AS, shows that Reform currently enjoys 31 percent support, with the Center Party coming in second with 26 percent. Both were at 27 percent support a month ago. 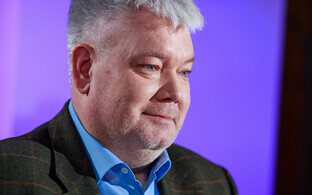 The Reform Party sidelined outgoing chairman Hanno Pevkur on March 19, 11 days into the poll and two days before Turu-uuringute AS finished its calls. 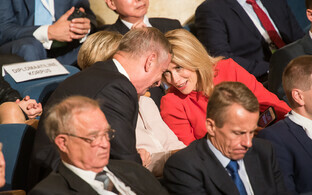 The leadership circle around designated chairwoman Kaja Kallas (Reform/ALDE) successfully pushed for Pevkur's replacement with Kalle Laanet as deputy speaker of the Riigikogu the following week as well. 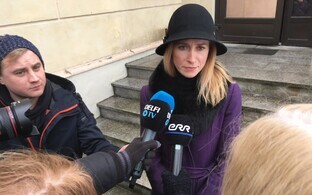 In this vote, the Estonian Conservative People's Party (EKRE) ran one of its own MPs, Henn Põlluaas, as a competitor against President of the Riigikogu Eiki Nestor (SDE). 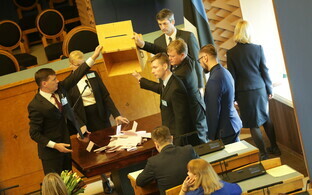 Though Põlluaas ultimately had no chance, he got 35 votes, which is plenty considering his own party has only seven mandates in the Riigikogu. 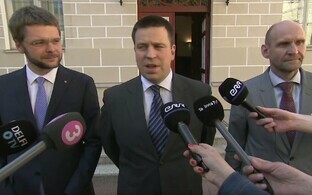 The post-election math hints at Põlluaas having had support out of the Reform Party, which hints at Reform and EKRE moving closer. 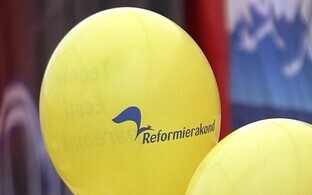 If this should turn out to be a lasting trend, it could mean that the Reform Party is keeping its options open for a coalition on the political right after the March 2019 elections. This again could work in favor of the Pro Patria and Res Publica Union (IRL), who despite being a member of the current government have made it no great secret that they would prefer to be part of a more conservative government. Whether or not this is realistic is unclear, as IRL is currently close to the election threshold. Support for EKRE is relatively stable, down 1 percent to 13 from last month's 14 percent. With this result, EKRE further solidifies its position as Estonia's third most popular party. The Social Democrats are doing slightly better than a month ago, up 2 percent at 10 from previously 8 percent support. The Pro Patria and Res Publica Union (IRL) and the Free Party both lost 1 percent and are now at 5 and 3 percent support, respectively. 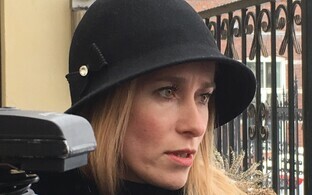 Given Estonia's 5-percent election threshold, both are in danger of losing their parliamentary mandates in the next election if present trends continue. 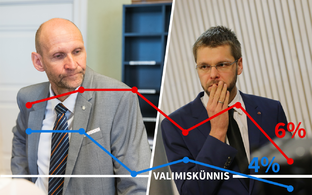 The Estonian Greens, currently without any mandates in parliament, are at 3 percent support. 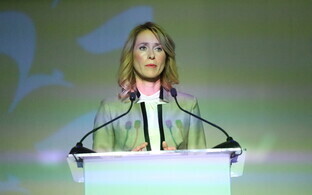 The combined support for the coalition parties (Center, Social Democrats, IRL) remained at 41 percent, while the combined support for the opposition (Reform, EKRE, Free Party) reached 47 percent, up 2 percent compared to February. The share of respondents who did not express a preference shrank from 35 percent in February to 29 percent in March. 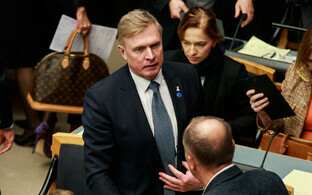 For the survey, Turu-uuringute AS polled 1,005 Estonian residents between March 8 and 21. The results of the survey represent those respondents who expressed a political preference. The margin of error of the survey according to the pollster is ±3.1 percent per 1,000 respondents.